Welcome to Medburn Park, Medburn, Ponteland, a stunning development of 50 large traditional detached houses in a countryside location 8 miles from Newcastle city centre. Offering very spacious four and five bedroom accommodation and each with double garage and two en-suites these houses are being built to a fantastic specification to include high ceilings, bi-fold doors, gas central heating, choice of traditional or contemporary kitchens (*dependent on build stage), Italian sanitary ware, burglar alarm (including garage), electric garage door and much more. 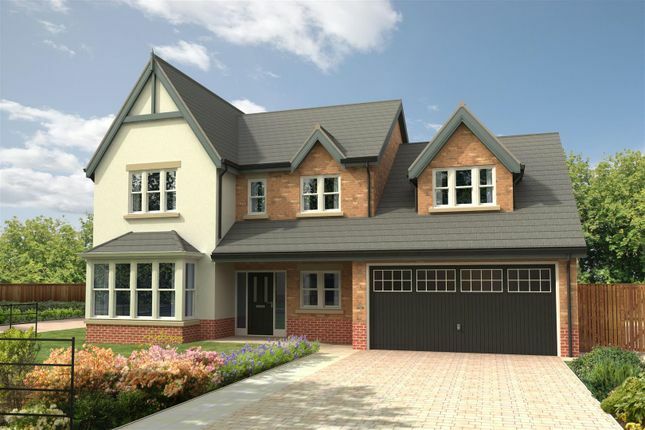 The Rudchester is an elegant four bedroom detached house with double integral garage. Having a kitchen stretching the width of the property The Rudchester has all of the benefits of modern living in a traditional house. 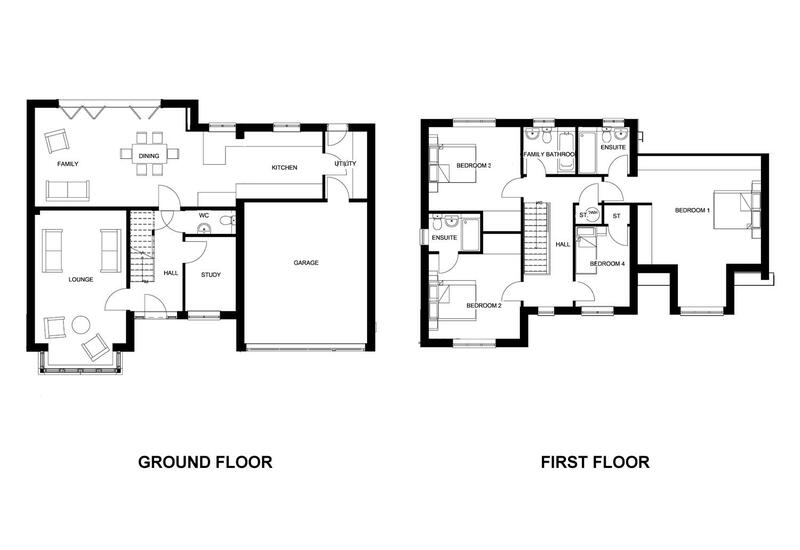 Also on the ground floor, complementing the kitchen, is a spacious lounge, a study and a separate utility room. All four bedrooms to the first floor are larger than average offering comfortable and flexible accommodation and benefitting from two en-suites. The Rudchester is a striking property with versatile, spacious rooms. Medburn Park is four miles or so from Ponteland which has excellent schools, a Waitrose, restaurants, a leisure centre, golf club, tennis club and a bowls club. Feature staircase to first floor accommodation. Under stair cupboard. Central heating radiator. Back to wall WC. Hand wash basin. Part tiled walls. Extractor fan. Central heating radiator. UPVC double glazed bay window. Central heating radiator. UPVC double glazed window. Central heating radiator. A choice of contemporary or traditional kitchen units (depending on build stage). Range of appliances, dependant on kitchen type. Bi-fold doors to rear garden and two uPVC double glazed windows. Central heating radiator. Units to match kitchen. Plumbing for washing machine and space for tumble dryer. Door to garage and door to rear garden. Central heating radiator. Store cupboard housing hot water storage tank. UPVC double glazed window. Central heating radiator. UPVC double glazed walk in bay window. Central heating radiator. Walk in shower. Back to wall WC. Vanity unit housing hand wash basin. Part tiled. Extractor. UPVC double glazed window. Heated towel rail. Built in cupboard. UPVC double glazed window. Central heating radiator. Panelled bath with shower oven. Back to wall WC. Vanity unit housing wash hand basin. Extractor fan. UPVC double glazed windows. Heated towel rail. Block paved drive. Turfed front garden. Rear garden. Integral double garage with electric up and over door. Electric power and light. Door to utility room. Fixtures and fittings mentioned in these particulars are included in the sale. All others in the property are specifically excluded. Photographs are reproduced for general information and it must not be inferred that any item is included for sale with the property. Disclosure - connected person invloved in sale. We are required under the Estate Agents Act 1979, and the Provision of Information Regulations 1991, to point out the client we are acting for on the sale of this property is a "connected person" as defined by that Act. Property descriptions and related information displayed on this page, with the exclusion of Running Costs data, are marketing materials provided by Keep Estate Agents & Chartered Surveyors, and do not constitute property particulars. Please contact Keep Estate Agents & Chartered Surveyors for full details and further information. The Running Costs data displayed on this page are provided by PrimeLocation to give an indication of potential running costs based on various data sources. PrimeLocation does not warrant or accept any responsibility for the accuracy or completeness of the property descriptions, related information or Running Costs data provided here.